Hospice is a program that provides special care and support for people nearing the end of life and their families. Hospice focuses on patient comfort and quality of life rather than cure. Local hospice services are facilitated through Crawford County Home Health, Hospice & Public Health or Gentiva Hospice. Crawford County Memorial Hospital works in collaboration with Crawford County Home Health, Hospice & Public Health and Gentiva to provide general inpatient care also known as acute Hospice care. Hospice patients can be admitted to the hospital when pain or symptom management can no longer be managed in the client's home setting which also includes the nursing home. Crawford County Memorial Hospital has two extra-large, private rooms available for Hospice patients. 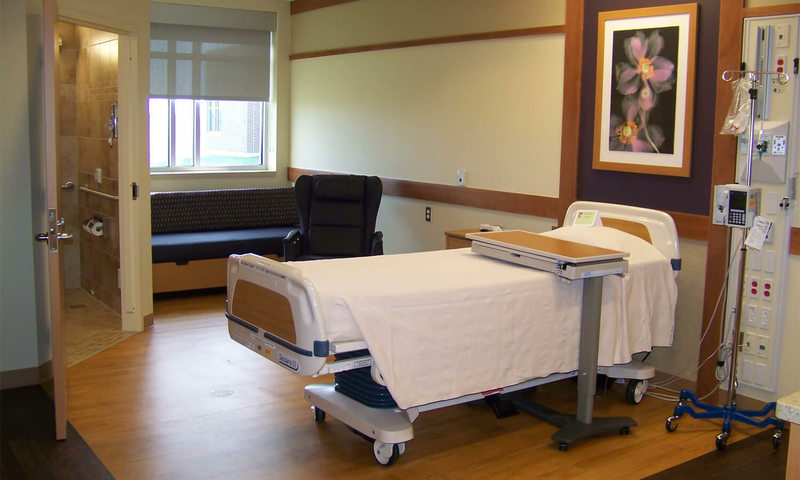 These rooms are located at the end of the hallway of each patient care wing and feature a semi-private sitting area for family directly across the hall from the patient room. When a Hospice client is admitted, he/she will continue to have daily assessments from his/her hospice nurse. Other hospice caregivers will come as needed. In addition to care provided by hospital nursing staff, the patient will also be visited daily by his/her physician. Family members of Hospice patients have unlimited visiting hours and may stay overnight in the room with their loved ones. For more information about Hospice services, contact Crawford County Home Health, Hospice & Public Health at 712-263-3303; or Gentiva at 1-800-GENTIVA or www.gentiva.com/hospice.